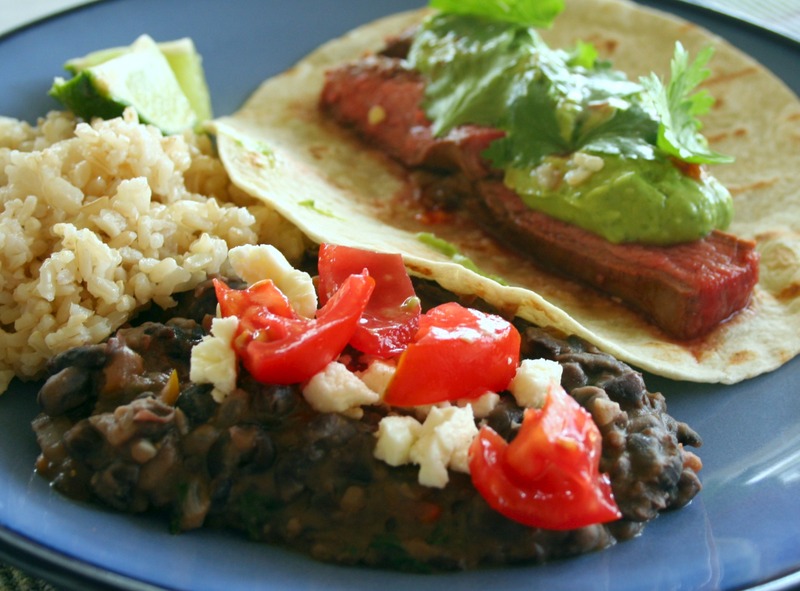 Quick Post: I wanted a healthy side for these steak tacos. They’re simple, quick and tasty; not to mention healthy. Even my picky husband who doesn’t like black beans ate some and my son really enjoyed them. I ate the leftovers served over baked brown rice and topped with a dollop of avocado dressing and some crumbled feta. Thanks for reading, enjoy! 1. In a medium sauce pan, heat a tablespoon of olive oil over medium-low heat. Add the chopped onion, bell pepper, and garlic and saute until softened. Add the drained and rinsed beans to the pot and smash some with your spoon. Season with cumin, salt and pepper and pour about 1/2 a cup of water over all to thin out the beans slightly. Cook for about 5 to 7 minutes and add your cilantro leaves – taste for seasoning. Serve with a lime wedge and feta (or cojita) cheese. Enjoy! Sounds delicious, Thanks for sharing. I will be trying this for sure. You’re welcome 🙂 I hope you enjoy them!